The Newberg Tigers faced a daunting task Thursday in playing Glencoe: either beat the Top-20 Crimson Tide at home or be relegated to the second tier of the Pacific Conference and hope for a favorable playoff game in order to continue the season. The Tigers appeared up to the task early on, taking Glencoe to the brink before losing 26-24 in the first set, then grinding out a 25-23 win in the second. However, the vagaries of volleyball began going the Tide's way in the third set, paving the way for a lopsided 24-16 setback for NHS. Unfazed, Newberg roared back in an epic fourth set that featured extended volleys and a plethora of lead changes to level the set score at two apiece with a 29-27 win. The fifth set was pretty much a continuation of the fourth set, with numerous lead changes and momentum shifts, before Glencoe won out 15-13 to take the match. 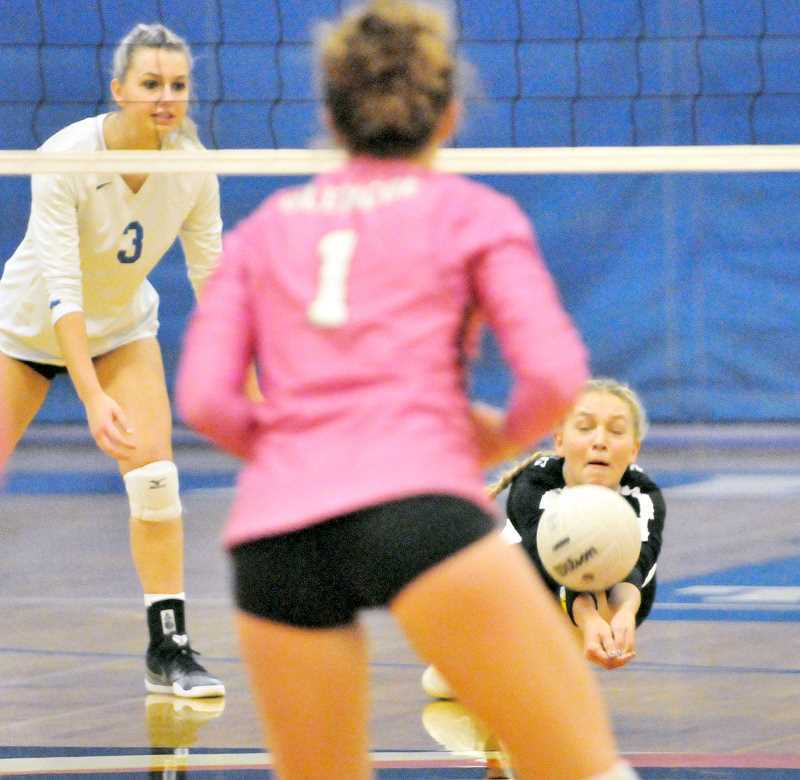 Ultimately, it may have been Newberg's inability to stop Glencoe's Jayda Lee that was the difference in the match. The lengthy sophomore played havoc on the Tigers' defense for much of the night, earning 34 kills and eight blocks. On the other side of the net Giselle Benetti powered the Tiger offense with 23 kills and 15 digs. Libero Grace Kassebaum anchored the backline with 37 digs, seven assists and possessed a 100 percent serving percentage for the match with two aces and a 2.67 percent serve-receive ratio. Brynna Geibel had 11 kills and 12 digs, while Lauren Griswold tallied 52 assists, two kills and two blocks. Becca Upchurch contributed four kills and three blocks, Madison Brumbaugh netted four kills and two blocks, and Tori Petersen killed six balls and blocked four shots. Despite the loss, NHS coach MacKenzie Upchurch said the Tigers had a strategy entering the game and pretty much kept to it. "We focused on eliminating our unforced errors, isolating their middle and eliminating the setter's opportunity to dump for points," she said. Defending Lee was key for the Tigers, but the Tide star would not be denied and she proved the difference in the game for Glencoe. "Absolutely," Coach Upchurch said. "We had planned on having to rely heavily on our defense in order to control her scoring potential." The Tigers had pulled into a three-way tie for third place with McMinnville and Liberty with just two games remaining in the regular season after an Oct. 10 win vs. Forest Grove. That placing was short-lived, however, when the Tigers lost to McMinnville on Oct. 16 on the road. That loss combined with the setback to the Tide on Thursday to relegate Newberg to a fifth-place finish in the Pacific Conference with a 6-6 league record (11-10 overall) and a 23rd ranking in the state. "Because of the way the rankings work and how competitive our league was, the losses didn't have a huge impact on our overall placement," MacKenzie Upchurch said. "We potentially would have played those ranked seventh to ninth regardless. We would have had to be ranked in the high teens for it really to have had a huge impact on the first round." Newberg will play Wednesday evening at Southridge, which finished fourth in the tough Metro League with a 7-5 record (14-7 overall). "We played Southridge out of league the first game of the season," Coach Upchurch said. "We've grown a lot over the season and plan to fight out as a team."